I don`t try to be funny....But when your parents named you "Jerry Berry" it comes along as a package. Figuring out the drive train is important but in the end the same engine will be used. Going fast (or faster) is affected by many factors but boils down to three things: Power, aero and traction. I don’t want this thread to swerve off the topic and turn into an aero discussion. Fact is that there is very little that can be done in Gas Coupe to improve the aero package. An air dam is allowed as long as the original grill opening is not blocked. You can also play with ride height, remove mirrors, remove wipers and remove minor trim items. All these help some but selecting the right body is the best thing you can do for aero. The factor that drives the aero consideration is the product of Cd x Fa. The smaller that number the less the horsepower needed to reach a certain speed. All other things remaining equal, the smaller the frontal area the greater the changes in aero with improvements in Cd. So how could I improve Cd within the rules? The Geo from 89 through 94 was offered in a few different “trim” packages including an LSI model and a (for some years) convertible. There was also a Suzuki version (Swift and Swift GT) as well as a Pontiac model offered in Canada called the Firefly. Mixing and matching trim from all these models is allowed within the rules. (Example – you can run the production air dam from a Vega GT on any model Vega). The Geo trim differences include two headlight configurations. Changing from one type headlight to the other is a bolt in conversion. The photos below show the standard base Geo Metro Headlight configuration on the left with the LSI model headlight on the right. Mine came with the inset, cheapo, standard models. I wanted the 'streamlined' LSI models. These are the lights that also come on the Suzuki GT. The Cd for the Swift GT is 0.320. Some of that improvement in Cd can be attributed to the headlights. Pulling the metro engine, trans, battery, air conditioning system and a bunch of other un-needed stuff from the front of the car has taken away weight that won’t be replaced. So I need to ‘lower’ the nose on this turkey at least enough to get it out of a nose-high attitude. I could just put some lead up there but think that adding weight to this LSR car will hurt performance. Two reasons I say this are, first this car will primarily be a Maxton and Loring car. Those venues are more like a long drag strip than a short Salt Flats. Second, I barely have 50 ft pounds of torque in this little engine and the lighter this turkey is the less ‘work’ this little engine needs to put out. For now – on pavement at least – traction will not be a problem. And of course if I am wrong I can then add lead as needed. Researched the web and find that the least expensive way to drop the front end on a Swift/Metro/Firefly is to cut the springs. Plenty of info on this at www.teamswift.net. For me I try to follow a rule of to never modify any part unless I always have a spare, unaltered, part to use when and if I screw it up. So I just picked up a pair of front struts with springs (thank you ebay) for $31.00. I have decided to hold off cutting anything until after the engine is mounted to see just how high the front end is setting. The build list includes replacing all the struts, mounts, and suspension hardware with new parts prior to hitting the track. 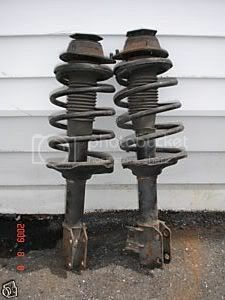 Photo from ebay of the Swift GT struts and springs I just picked up . . .
Driving the front wheels with a chain. 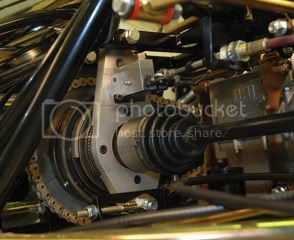 This isn't rocket science but it is a challenge because there is not very much room (fore and aft) to place the engine. Remember this is a gas coupe that will also run as an altered. So I can't move the engine any farther forward than the body panels will allow. Otherwise I will be only able to run competition coupe. This all mandates using a very short chain which brings a set of problems to play and especially the critical issue of chain alignment. Plus I want to run this setup at Maxton (1 mile), Loring (1.5 miles) and Bonneville (short course -3 miles) so I have to plan of being able to change ratios without disassembling half the darn car. I contacted the people that had fabricated that swap and was able to get their remaining bearing blocks for the cost of shipping. I also found out that the original car was later sold to a racer that swapped the CBR600 for a CBR900 and used it to win a 24 hour road race – 24hours of Lemons. That was a good test to show the open, non-lubricated diff can survive. Here is a photo of the west coast car with the original chain drive conversion. I don't feel need to go with a double chain. For one reason I don't have as much clearance around the engine sprocket. My cbr600RR has a different water pump design and location which it inhibits what I can use as a drive sprocket. 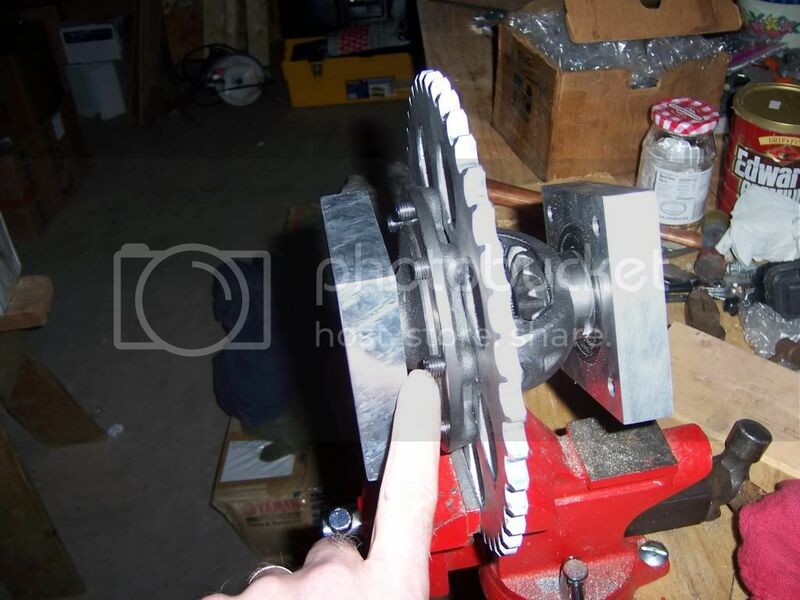 After running several spread sheets with ratios, speeds etc I decided to use a driven sprocket with 45 teeth and if that one is too difficult to pull I also ordered one with 48 teeth. 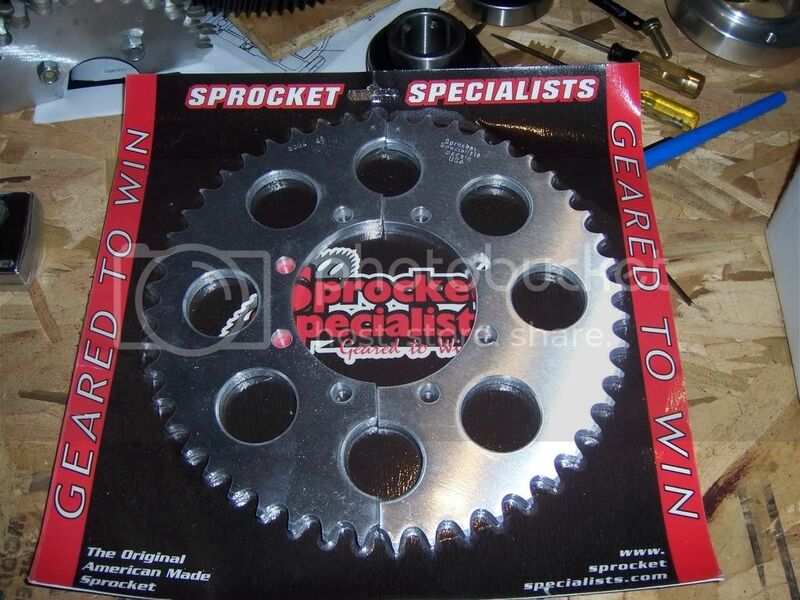 I ordered the custom sprockets from Sprocket Specialties. They are split sprockets so I can remove/change them without removing anything accept for the chain. Sprocket Specialties also provided me with the drive sprocket to adapt a 530 chain (original equipment is 525) for the Honda. I am using a 530 chain – which is wider than a 520 or 525 chain. I decided to do this because it allows for thicker sprockets. I don't want to be tearing up sprockets. However with the thicker sprocket and chain I have almost no room to mount the driven sprocket on the right side of the ring gear mount. So I am moving it to the left side. This provided a small clearance problem for center opening of the driven sprocket. I realized that I would either have to remove a little metal from the diff or from the sprocket to get a good fit. Before I did that I loosely mounted half of the sprocket to test fit the engine, diff, etc in the car to see how everything lined up. 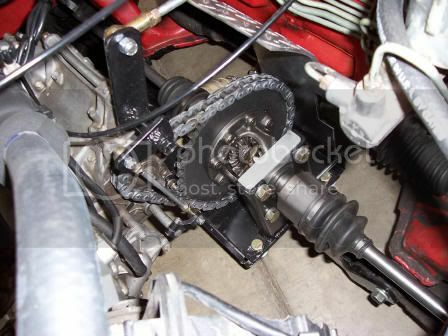 Here is a photo of my diff with half sprocket mounted on left side of ring gear flange. Here is the engine propped up in the car with the diff attached to the half shafts and hanging from a strap in the position where it will be when the car is finished. The camera angle is a bit deceiving. 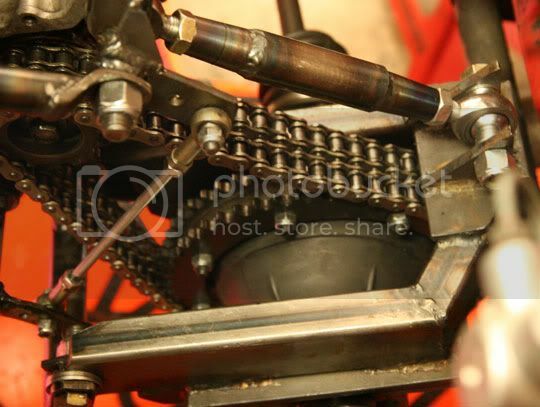 There is actually more clearance between the steering rack and the sprocket then it appears. The wooden block is covering part of the drive sprocket but you can see some of it to the left and below the block. As you can see this will not be a very long chain. The good news is that everything lines up. 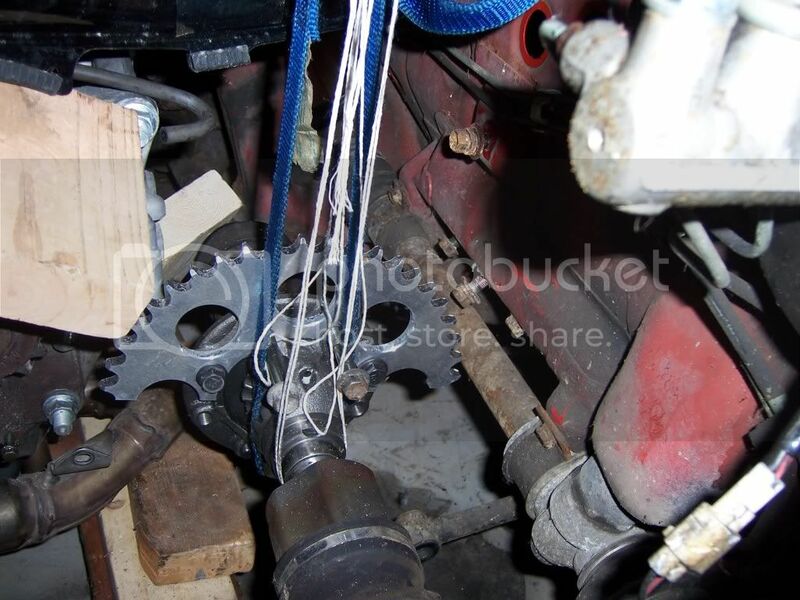 I also was able to discover that the engine will need to be tilted a few degrees nose up to prevent the chain from hitting the engine case below the sprocket. Now I can proceed to modify the differential and mount the sprocket, bearings and bearing carriers. 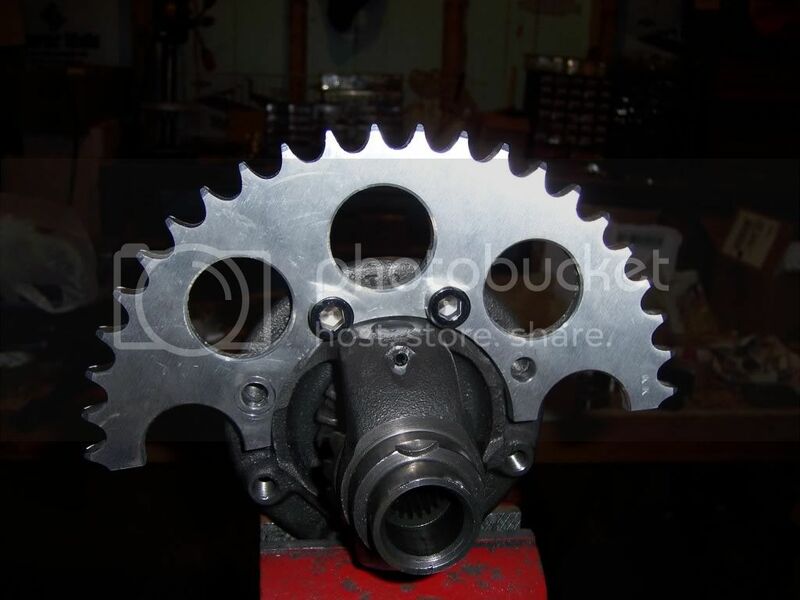 What size drive sprocket are you useing? Quick question. Did you re-drill the gear carrier, or was that good old fashioned luck? J.B.
Why couldn't you just turn the carrier 180 degrees so it was facing the other way? Then you'd be able to mount the sprocket on the fully machined surface. That might even give you a little more room. Thats kinda what I thought too. I had considered going with a custom spool to replace the metro diff. Maybe even have some custom halfshafts. This would allow for mounting of a one piece sprocket instead of a split one. The carrier could easily be flopped 180 degrees but the clearance problem would still be there. The bearing holder on that side is a very tight fit. Picture a sprocket and the heads of mounting bolts fitting where my finger is in the photo. To fix this I could come up with a different bearing carrier design that would leave some space. Maxton is the test bed for this car. I can use the mile to see what problems come up with the compromises I have made with this design. I expect to be using up a lot of chains. I wonder what sprockets (size/ratio) Johnny is running in his Modified Sports Fiat? How about cutting the carrier blocks in half and grafting the stock bearing caps to them? You could flip the carrier 180, then remove the cap on that side ( leave the other in place) and have enough room for a sprocket change. :cheers:J.B. I've also been thinking about the split sprocket. After a little research I found that Radical - the sports racing car people - use split sprockets on some of their sports racers. Here is a copy of a photo of one of their setups. If you look closely you can see the split sprocket. For now I'll stay with the split design. Next - engine and drivetrain mounts . . . only 100 days until tech for the first Maxton 2010 event.